A collection of fun Easter crafts, worksheets, and activities for you to use in your classroom. Each student makes their own Easter bingo board using the picture squares. Then the class plays Easter bingo together. Kids love to make this bunny with arms and legs that move. Color and cut out the rabbit's parts, then attach them together with brass paper fasteners. Cut out the rabbit's ears, face, mouth, arms, legs, and tail. Then glue them onto a paper bag to make an adorable Easter Bunny puppet. Cut and fold this cute Easter bunny cootie catcher for some Easter fun! Cut and fold this Easter cootie catcher activity to make a cute girl Easter bunny! Cut out the letters in the words EASTER BUNNY. Rearrange them on the table to make as many new words as possible. This version includes primary-ruled lines for younger students. Cut out the letters in the words EASTER BUNNY. Rearrange them on the table to make as many new words as possible. This version includes a more advanced scoring guide for older students. Can you unscramble all of these Easter words and win the bunny's golden egg? This worksheet is easy enough for third graders, but is challenging enough for kids and adults of all ages. Can your students find all of the Easter words hidden in the puzzle? Words to find include bunny, spring, grass, basket, lily, and many others. Perfect for third grade and up. An easier version of the word search for first and second graders. Does not include words hidden diagonally or backwards. Read each word on the Easter egg and count the syllables. Color the egg according to the key. These eggs have synonyms and antonyms written in them. Color the synonym eggs yellow and blue. Color the antonym eggs pink and green. How many mistakes can you find in this Easter paragraph? Errors include capitalization, punctuation, and spelling. 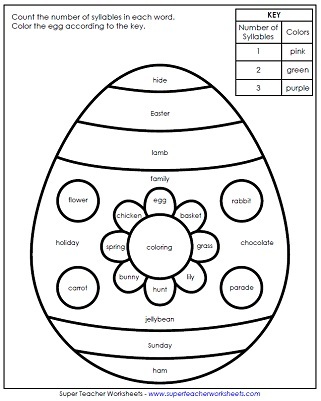 On this graphic organizer, students write about the terrific things they smell, see, hear, feel, and taste on Easter morning. Students cut out 25 sight word cards. Then they rearrange them to make as many complete sentences as possible. Some cards have basic sight words, such as we, she, see, I, have, will, you, it, and can. Other cards have Easter-themed words, such as bunny, hop, grass, eggs, hide, and basket. Students use scissors to cut out five word cards. They rearrange them to make a complete sentence. The sentence reads, "Let's find the Easter eggs." Students use scissors to cut out five word boxes. They rearrange them to make a complete sentence. The sentence reads, "What is in my Easter basket?" The Easter Bunny has injured her toe and won't be able to hop around the world to deliver her Easter eggs! Can the bunnies find another way to get the eggs delivered in time for Easter? Emma is worried she won't find any eggs at the egg hunt, because most of the kids there are bigger and faster. Ian and his little sister, Amy, are hunting for eggs. Every time Amy sees Ian pick up an egg, she yells, "Mine!" Should Ian share his special eggs with his younger sister? This is a cute poem about hunting for a golden Easter egg. Erica's class is excited about their Easter float, and when Mrs. Jackson asks for a volunteer for a special part in the parade, Erica jumps at the chance. The part isn't what she expected, but it will certainly make her the star of the parade. This black-and-white story picture shows a bunny running away from some baby chicks. Students color the picture and write a story to go along with the scene. This black-and-white story picture shows two Easter bunnies with giant Easter eggs. This black-and-white story picture shows two kids dressed up in costumes. One of the kids is dressed like a bunny. This black-and-white story picture shows a small rabbit with three helium balloons. This color story picture shows a rabbit juggling colorful Easter eggs. Eight pages of Easter pictures that kids can color in. These are terrific for kids who complete their work early and have extra time, or use them to compliment your students' Easter writing projects. Color the April Calendar, then add this year's important dates. This cute calendar has pictures of umbrellas and flowers. Subtraction mystery picture of an Easter bunny with a basket of eggs. Division mystery picture with a bunny, basket, and eggs. Color-by-Number mystery picture with a rabbit and eggs. 2-digit addition problems inside pictures of Easter eggs. 2-digit subtraction problems inside of Easter egg pictures. 2-digit multiplication problems inside pictures of Easter eggs. 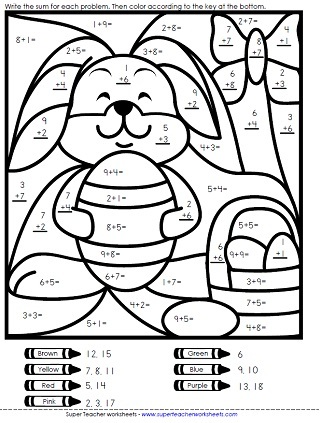 This worksheet has four very basic addition and subtraction word problems with an Easter theme. This page has four addition and subtraction word problems. Subtraction problems require borrowing. This page has advanced subtraction, basic multiplication, and basic division word problems. This page has a mix of addition, subtraction, multiplication, and addition word problems. This complete spelling unit has a word list, worksheets, puzzles, alphabetical order activities, flashcards, a word wheel, and spelling test forms. Words include: egg, spring, ham, hide, chick, basket, bunny, candy. 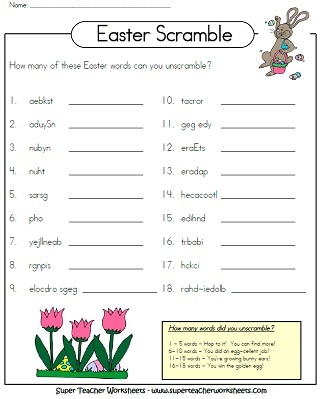 The 2nd grade Easter unit has a word list, puzzles, ABC order activities, and assessment pages. Word list: bunny, find, hop, basket, spring, ham, candy, carrot, chick, color, hide, rabbit, and egg. This 4th grade spelling unit includes a word list, worksheets, and puzzles. Words include: basket, daffodil, and parade, carrots, tulips, rabbits, Easter, springtime, brunch, hopping, hidden, jellybeans, butterfly, chocolates, decorate, duckling, bonnet, coloring eggs, Sunday, and pastels. The fifth grade Easter spelling list includes the following words: lily, decorate, Easter, colored eggs, blossoms, baskets, Peter Cottontail, parade, chocolates, bonnet, daffodil, jellybeans, hard-boiled eggs, springtime, joyous, brunch, butterfly, rabbits, pastels, and outfits. We have spring word puzzles, math activities, calendars for kids to color, and reading comprehension passages. Calendars for each month of the year. Students write the dates and holidays. Print out leprechaun word searches, St. Patrick's Day word scrambles, coloring pages, and more.